Forestry - sunrise or sunset industry? George Haimona prepares the bioplastic for weaving. Rotorua iwi Ngāti Whakaue have been working with Scion scientists to deliver a unique educational project that merges our science and innovation with traditional Māori knowledge. 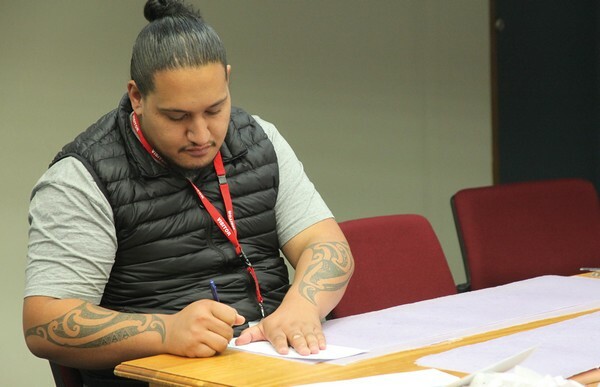 The project was initiated by Te Taumata o Ngāti Whakaue, who run Matakōkiri, a science eduation programme for rangatahi (young people) between 7 and 14. Their latest project was to build six bilingual science kits. Eva Tait, one of the Ngāti Whakaue Matakōkiri programme co-ordinators, says, “We wanted a sustainable container to hold our resources, designed and created by iwi and Scion scientists. We spoke to Lou Sherman, Packaging Research Leader from Scion, and together with Lee Warbrick and Caroline Newton we came up with a concept of working with local experts in their field, Te Arawa weavers and local scientists from Scion to create a container combining harakeke and plastic. Over a few months, the team from Te Taumata and Scion co-designed a project, using three different manufacturing technologies, to build three very different harakeke kete (baskets), unlike any you’ve seen before. They applied for and received a grant from MBIE’s Curious Minds fund to do the mahi (work). Together, they planned an educational journey for 15 Ngāti Whakaue rangatahi. Starting at Tunohopu marae in Ohinemutu, these rangatahi spent time with their whānau (family) learning about traditional ways to work with harakeke (flax). 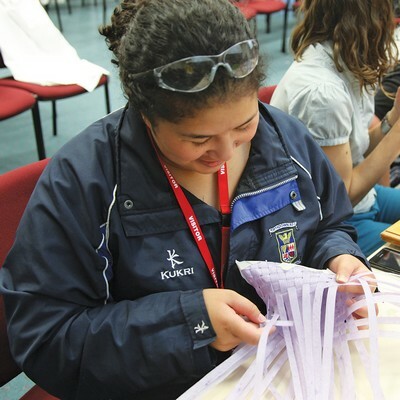 The students then spent three sessions at Scion with Lou Sherman, Ben McDonald and Dr Marion Sanglard who each led a group to create a harakeke and polymer kete prototype using a different method. Ngāti Whakaue weavers provided Scion with bundles of prepared harakeke fibre known as muka. The muka was processed at Scion and added to 3D printing filament, sheets of biobased and industrially compostable PLA plastic, and dried as thin strands. 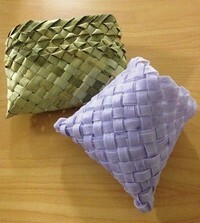 From there, the materials were used to make prototype kete. Ben’s group studied and scanned the structure of a traditional harakeke kete. They used computer based CAD modelling to modify the scan so it could be 3D printed using the harakeke-infused filament. Marion’s group took a slightly more traditional approach and cut up sheets of the harakeke/ biopolymer then wove the strips into kete. 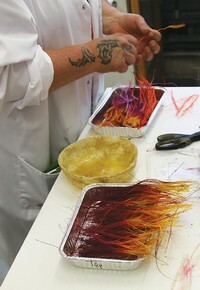 Lou's team dyed the harakeke fibres in bright colours and set them in resin. They also created some of their own moulds to make uniquely shaped kete. In between kete design and build, staff demonstrated how extrusion was used to make sheets for weaving and the 3D printing filament, and also showcased material characterisation methods using microscopy and tensile testing. For Ngāti Whakaue, using harakeke in this way merges mātauranga Māori with new technology. Eva says, “Historically our people used harakeke for everything. We had flax mills here in Rotorua, and it was a big industry. When synthetic composite, and then wove the strips into kete. Lou’s team dyed the harakeke materials became available the flax use dwindled because it wasn’t viable as a commercial product. We wanted to revive the use of harakeke and wanted our young people to know that our people used harakeke for everything and anything”. Rangatahi returned to Tunohopu on 25 May to showcase the kete to their Ngāti Whakaue whānau, peers and the Scion team. Scion and Te Taumata are now investigating other material development projects they can undertake together. Lou says, “It was great to show the group how we approach innovation. Building on generations of knowledge of harakeke we tried to push the boundaries on ways it can be used. Watch a video of the process and outcomes and find out more about the project.